Advertisers know that not every view is created equal and that it’s important to understand your brand in context. It’s why ad tech companies created targeting options. It’s why content can be bought by topic. Are the companies creating content thinking about getting the most value out of their audiences in the same way? 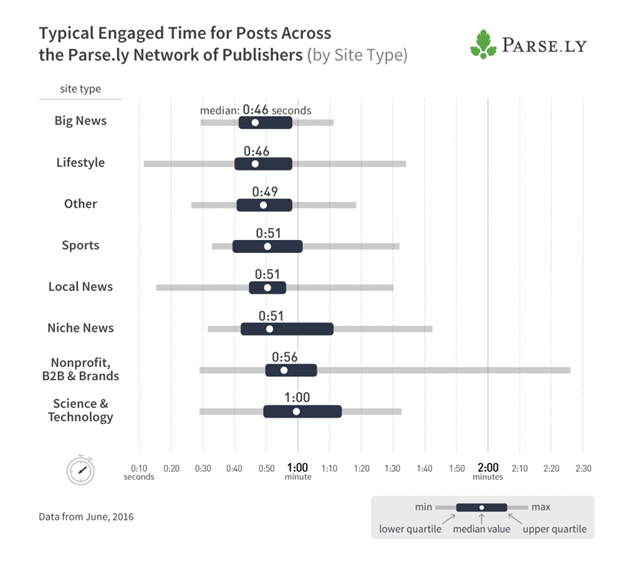 To figure out if this is the case, we examined Parse.ly’s publisher data to see how much volume different topics produce. We broke this down by the number of articles written and the average pageviews per article. Then we compared that to how advertisers value different audience segments. Examining how people find different topics online revealed that the subject matter of an article has an impact on the likely source of traffic. For example, in a sample of one million articles in the Parse.ly network, Facebook brought in 87% of pageviews to lifestyle content. Google search accounted for 61% of readership to technology stories. In addition to learning how people found the articles, we looked at how did each topic compared by scale and popularity. Articles that fell cleanly into the lifestyle or U.S. presidential politics categories received the most views, while articles about sports and entertainment were the most common by volume. A couple of explanations about our methodology are worth noting. For this report, we selected articles that fell cleanly into one category. In other words, we selected articles where at least two thirds of the words were generated by a single topic. This left us with a subset of just over one million articles that we could cleanly assign to a single topic. For example, imagine that most articles that are written as a mix of two or more topics. Those will be excluded from this analysis. It simply doesn’t make a clear conclusion to say that “mixed-topic articles with a lifestyle slant” tend to get more pageviews. However, we can confidently say that articles that are mostly about lifestyle tend to get more pageviews than articles mostly about business. The extremes are quite telling. An average article in the lifestyle category gets nine times the pageviews of an average article on business and finance. So, does this mean the lifestyle pageview will bring in nine times as much revenue? So, the really interesting question is how a publisher can match monetization to the potential expected pageview or volume, regardless of scale. For example, even if the advertising value of certain topics are lower, the high volume of certain content types opens up other monetary opportunities. Lifestyle publishers and Condé Nast brands such as Condé Nast Traveler and Allure are forging partnerships to create branded subscription boxes. Efforts like these allow them to take advantage of the large “top-of-funnel” audience to drive purchase conversions. Our team was surprised that the average views for each sports article ranked so low among topics. Given that the high-volume content was comprised mostly of local and even high school sports means that the average view totals are much lower. This is particularly true when compared to the audience for stories about national leagues. It is also worth noting that a preponderance of extremely short stories—such as those on game stats, syndication or even automated sports reporting—contribute to the high volume. Taken in aggregate though, readers generally engage well with sports topics. A previous study we did (based on different data, but also looking at topics) found that sites focused on sports had a median engaged time of 51 seconds per article. Thus, sports can offer a strong monetization opportunity beyond pageviews. Engaged and loyal audiences can be monetized more easily through subscriptions, live events, or membership models. Job postings are an example of a topic with low article volume—the lowest, in fact, of all topics analyzed—and high pageviews per article. From our research, we learned that the majority of traffic to job postings comes from Google search, which drives 84.4% of referral traffic. Facebook drives 11.9% of traffic comes, while the rest comes from other sources. This kind of traffic breakdown makes sense in the context of pageviews. If readers are searching for very specific information, a small subset of articles could generate a high volume of pageviews. The classifieds are unlikely to return to their status as a primary revenue driver. However, for any scenario where you have a high amount of traffic to a low amount of content, there is likely to be room for revenue growth. The data we used for this study identifies ways that audience data should be considered for revenue potential, especially for opportunities outside of traditional display advertising. However, to be fully acted on, audience data must be synced in a way, both culturally and technologically, that connects it to business and monetary objectives.